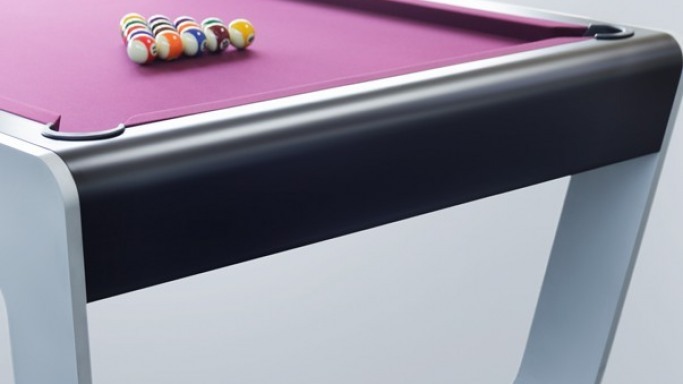 The most popularly known Porsche Design Studio has designed an exclusive high-end billiards table called ‘24/7 Billiard table’. This design is very futuristic in appearance and is in stark contrast to the bulky and rather largely-built billiards tables that we are normally more familiar with. The design is very clear with distinct lines and a spherical geographical which gives it an aesthetic appeal. The 24/7 billiards table has been designed in accordance with the Porsche-Design-Studio Principles that ensure optimal functionality along with shape and structure. The typical line haul of the design carried the hallmark of the founder of Porsche- F.A. Porsche- which is precision and dynamism. Hence, the entire package provides an end product that gives perfect utility and performance catering to the highest demands. The quantity in terms of materials is kept minimal in keeping with the minimalistic chic philosophy of Porsche Design Studio who believes in keeping it simple and not decorating beyond the requirement. The 24/7 Billiard table is made out of aluminum which has a lacquer finish and tulip-wood. The table is hand made in Austria and the product’s expected delivery time is between 6-8 weeks. The price of this uber-sophisticated billiard table is 35 thousand Euros which is exclusive of delivery and installation. This table is created with technical expertise by incorporating high –tech 3-D water jet cutting procedure and is therefore an excellent amalgamation between technology and aesthetics. The dimensions of the table are 254 cm x 142 cm x 83 cm and it weight approximately 290 kilos. Each billiards table has leather pockets, superior quality SIMONIS (customized colors choice), a professional three-part slate and optimal quality rubber cushions. The table will come with a triangle; a ball set (ARAMITH), a cue rack, a bridge stick and two premium cues as per the design of the table.